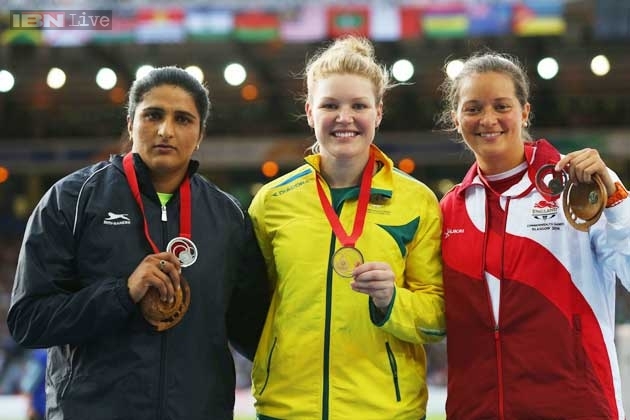 CRAWLEY athlete Jade Lally threw a season’s best in the women’s discus to win bronze at the Glasgow 2014 Commonwealth Games. Lally finished fifth in Group A during Thursday’s qualification round with a throw of 57.13-metres, earning automatic qualification for the final. The Crawley athlete looked full of confidence as she began her first throw in the final, giving a thumbs up after seeing the official distance of 57.69m. The 27-year-old then threw a season’s best of 59.56m on attempt two, before beating that in attempt three with a 59.98m and left her second in the standings at the time, behind Australian Dani Samuels.